The Sages explain that the whole people gave themselves up to prayer and repentance, while the High Priest stepped into the Holy of Holies to officiate in their name. It was therefore most appropriate that they should all know the moment when he entered the Holy of Holies. The gold bell was discovered in an underground drainage channel dating from the time of Christ, when the Temple was still standing. 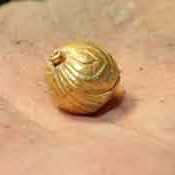 The finely engraved, pomegranate shaped, gold bell was sealed all around, so it was x-rayed, and archaeologists could see the 4mm clapper, still intact. It was suspended on a gold wire, striking the bell precisely in the middle. The amazing thing is that the bell still rings! So it was sent to a music lab where it was sampled, amplified 72 times, and played back in rapid succession, the way the bells would have sounded on the hem of the vestments when the High Priest walked barefoot into the Holy of Holies of the Temple itself. Only the High Priest could enter the Holy of Holies, and then only on Yom Kippur – the Day of Atonement – the holiest day in the Jewish calendar, but his movements could, thanks to the bells, be heard..
It’s interesting to note that the frequency of the bell is 240 hz, which corresponds closely to the musical note B. But why “B”? In the ancient world, the note B represented the planet Saturn or Saturday, which was the 7th day of the week. For the Jews of course this is the Sabbath day, known as “Shabbat” in Hebrew. Indeed the word for bell in Hebrew, “pa’amon” has a numeric value of 240. So the ringing of the bells on the hem of the High Priest sounded out a central tenant and message of our biblical faith: The Sabbath, the celebration of life, and belief in a premeditated act of Creation by a Creator. I invite you to join me here in Israel and experience a 3-D living color Bible- a blessing without measure! We’ll see the golden bell that was on the hem of the High Priest’s robe when he entered the Holy of Holies of the Holy Temple in Jerusalem. We’ll visit the Temple Mount excavations, and can even help wash archaeological remains in search of artifacts. This entry was posted in Jerusalem and tagged biblical music, City of David, golden bell, High Priest, Holy Temple, Jerusalem, Jerusalem Temple, Jewish temple, Mount Moriah by zshavin. Bookmark the permalink.